When you have so many bedroom colour ideas swimming around in your head, it can be hard to choose one out of so much choice. I’d like to write a little about bedroom colour today; as I had this particular problem when looking at some bedroom colour ideas for the master bedroom at a recent clients. 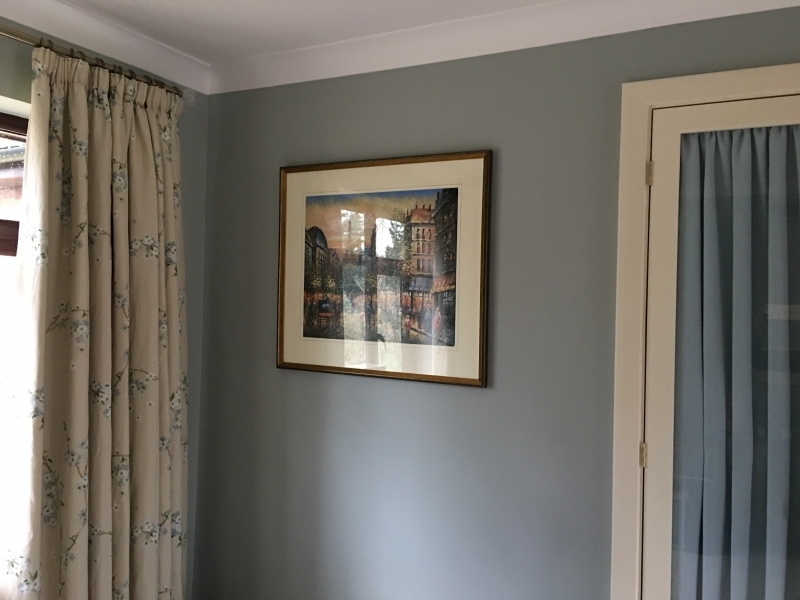 Luckily the client narrowed down the choice from the huge breadth out there and in the end, we went with Light Blue from Farrow & Ball. Currently, I am putting together the finishing touches to that room. A space that I have been working with for six months. I have a month to go because, typically most smaller projects can take up to a year, especially when you are dealing with different rooms in a house and are waiting for decisions to be made by a client rather than making the decisions yourself. It’s as well to mention this because I am finding that when I am waiting on decisions, organising, planning projects, facilitating workmen on site and generally catching up on business paperwork, I find that I miss working with colour. This of course can be done by working with wallpaper, fabric, furniture as well as paint colour. But it is something that all creatives will miss if they take a long enough break from working and creating with colour. Sometimes it just takes an hour or two to refresh the mind and relieve the creative need to use colour. Just a short time of working with colour is enough to satisfy that creative need so that you can get back to the nitty gritty of organising deliveries, work schedules and professional relationships, that makeup the bulk of an interior designers workload. In this project, the minutiae of this job has taken over the more enjoyable aspects of this job such as putting together colour schemes for the various different rooms in the property. But, today I am taking a welcome trip back and creating some combinations with rugs which are the last thing that we are working on in the various rooms. Unlike an installation day, when the rugs are one of the first things that get put into a house, the rugs in this case are coming in last because of all the accessory buying that has taken place over the last couple of months. Below is a shot of one of the corners of the room. 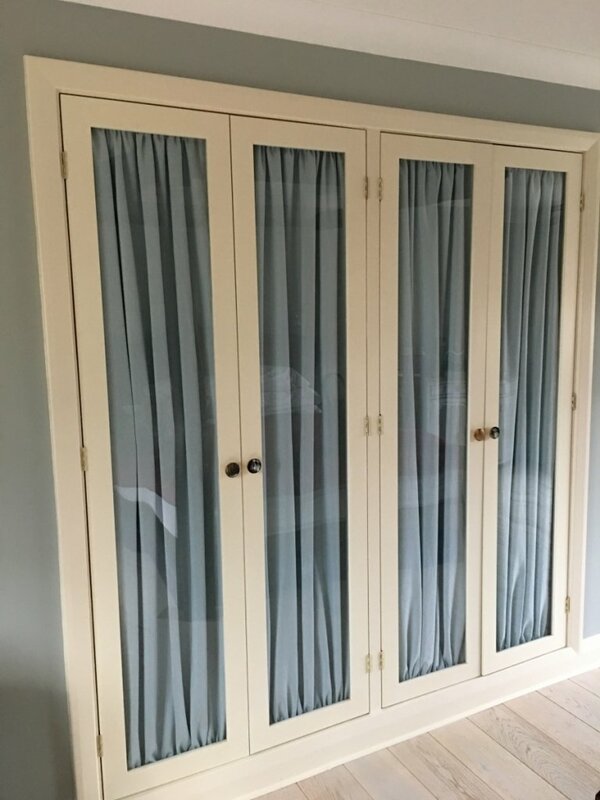 You can see the curtains, wall colour and closet door lining works well together. Let’s look how this was decided upon. The flooring in this room is a timber flooring in white washed finish. There are no rugs (as yet). The walls were originally an off white. So it was very cold and nondescript. Adding colour was a must and the clients liked blue (although one half of the clients thought it was more grey!) and this was a good choice, being not too bright, nor too neutral. Light Blue by Farrow & Ball is a very understated colour, bordering on grey but it is most definitely blue. It is restful as far as bedroom colour ideas go, as most pale or dusky blues often are. The woodwork colour was left to me. I needed to soften this room further and chose New White as it is an off white and is kinder to the eye. I almost never paint my wood work items brilliant white anymore. There are so many better neutrals to choose from. I would ban yourself from even looking at normal white! Once you have a colour, you know that everything else is going to stem from that. Everything sits against the walls so it all has to work with that colour. Especially if you have non creative clients who expect things to match, rather than contrast in their home. This took weeks to decide. I presented quite a few fabrics, both traditional and modern to the client. You can see me touring the house and talking about this fabric choice here. I knew she was going to be fairly traditional as she had already picked out a Voyage fabric with a leaf design as an option. But I knew this would have been very heavy (again) and it did not move the room forward enough. We needed to lighten the room, make it more feminine and soft, but not turn it into a girly pink paradise. Blossom Tree fabric from Sanderson was the perfect choice. It’s a linen, so very light and natural. Not too spriggy or loud florals, and a good base neutral to start off with. 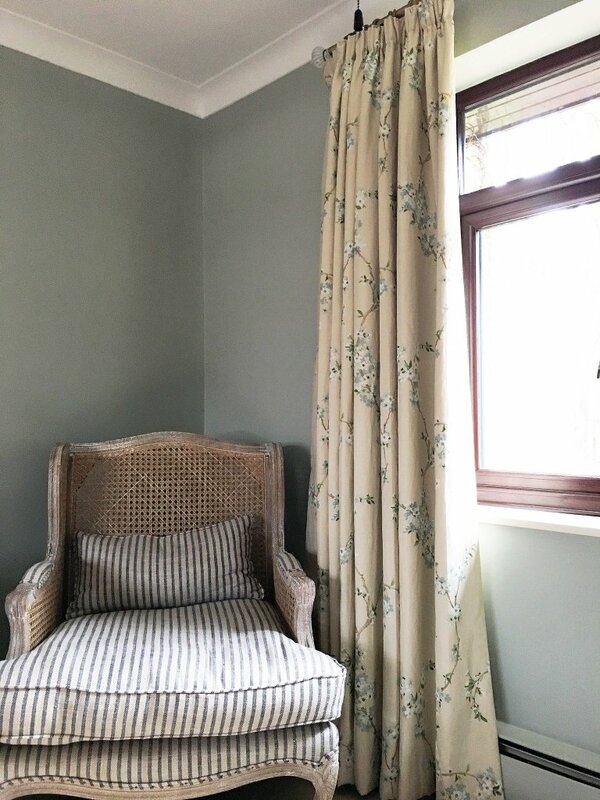 It worked well with the Light Blue of the walls and if lined and properly interlined like all good curtains should be, it would work both in the hot summers and the cold winters of the UK. Now why do this, you may ask? Simply because I wanted to add more texture into the room. No glass finish was apparent in the room, apart from the windows, so as the doors of the closet were to be changed, I had a choice to add in more wood to the room or add something different. Glass with a fabric lining was a traditional choice as it has been used in many colonial interiors and would complement the four poster bed for this reason. It only remained for me to choose the fabric colour. A print could have been used but the pleats and folds were pattern enough. After a little deliberation, I chose Romo’s Linara fabric in colourway Solent, which line the wardrobe doors. ‘Solent’ as a colour was bold enough but not matchy matchy to appear too studied. The horn handles were from Graham & Greene and added an exotic touch to the room. There are darker elements to this room, notably the dark wood four poster bed. My choice would have been to remove this bed to lighten the room more. But as it is staying, I decided to bring in lighter wood elements at either end of the room, surrounding the bed. The only other items with a definite a colour was the cane armchair from Graham & Greene and the sideboard from Loaf. Both were white washed in finish. The armchair has a deep blue stripe on a neutral linen background. Below you see the chair, (looking a little squashed, which is not surprising as it’s very comfortable!) and the curtains together. So potentially, this deeper blue could be incorporated into the only remaining item to buy – the rug or rugs. Rugs should ground a room. They bring everything together or they should do. When looking at colours for rugs, including the borders that surround the rugs, you need to have all your samples to hand. This includes the paint colour on the walls and woodwork, curtain fabric and any other soft furnishing fabric that may have been used. I am glad that the client has been open to adding in different shades and tints surrounding the Light Blue and I would like to add more. But I think I will keep this rug within the current spectrum of colour and add accent colour within artwork when the time comes. So what colour rug would be suitable for this room? You could of course go neutral and use the putty colour, which is the background colour to the curtains. This would be the obvious choice. Secondly, you could go with a variety of blues to compliment the various shades that now sit within the room. Thirdly, you could bring in an element of green which is also represented in the curtain fabric. But I think my client would be averse to this. Not so much so that ‘blue and green should never be seen’ as the old saying goes; but I think she errs on the side of safety, and would balk at the suggestion of adding green to this scheme. Nevertheless I am going to add in the option of green, just in case she wishes to take a brief plunge and adopt something surprising and delightful. Even some of the most unlikely colours can work together. In the same house I have put pink with blue. To be more accurate, the blue is a dark royal blue and the pink can be either seen as peachy or more raspberry. The latter is particularly good with navy, so this combination will look very smart when the room is finished. If you need further help with putting colours together, you may find Room Colour useful. I’ve added in over 70 palettes to choose from – some brights and some neutrals. It may help you out or give your client food for thought if they are struggling to decide. After you have a good idea of what colours you would like to see in your rug the next stage would be to decide whether you would like any kind of pattern on your rug. This could bring in further colour and you need to be aware that you could bring too much colour into a scheme. This is why it is essential to try and stay with your bedroom colour ideas that have been selected. Don’t be swayed by lack of choice for one particular item. Take your time. Plain rugs are easier to find but all in all, it’s nicer to place a patterned rug. Both to increase the number of prints in a room and to use different colours within those prints to tie up to the other elements of the decoration. It can also be more practical for clients to have a pattern that disguises marks that usage will inevitably bring! Of course these days and thanks to the internet you have a wide variety of rug sellers to choose from. Naturally you have to look at pile as well as colour, and often, size can be the deciding factor if you are looking to buy ‘off the shelf’. Don’t discount going for a cow hide rug if the room is modern enough. I tend to choose rugs according to budget as this is often the deciding factor with clients when choosing a rug for a home. But if I have the need for a rug of a certain size I will often have one specially made for that purpose. This is the case with this particular room and also with the sitting room rug in the room below this master bedroom. The shapes are almost the same but the colours are not. It can take time putting a colour scheme together and if you want to create rugs or carpet in a bespoke fashion it will also take an increase in the budget; something to discuss with your client from the outset. Another option to bring the colour scheme together is to add a border to a rug. This is often a wise thing to do both to finish the rug off decoratively and to delineate a particular area of the room with the rug. It just gives a definite container to the space. Your only choice is then one of fabric or finish. Suede, leather, cotton and linen are just some of the options to choose from. Or you can have the rug jut ‘bound’ which is the other common way to finish a rug. I have enjoyed looking over all my bedroom colour ideas and deciding on the right ones for my client’s room – and the story isn’t over yet. The trick is to view or see everything and then make a decision from there. Taking risks is not only part of being an interior designer, it is also part of being a business person. Sometimes you have to push the boundary and try something new and untested. If something works well but your client is not inclined to try it, keep your ideas on file for when you have a more brave client to work with. This is especially true of colour. Many interior designers use their own homes for such testing both with products and with colours. Many of our homes have a variety of different colours and styles as we work through our creative ideas and see them come to fruition in our own homes, before unleashing them on our paying clients! Often our clients are very conservative and choose from a barrage of neutrals. This can be disconcerting for those of us that enjoy colour. This is where testing comes into play. Colour can be a case of trial and error as we paint swatches on walls to gauge our clients reactions. Even though we know the colours will work, it can take days or weeks to convince clients that colour is the right way to go. You just have to persevere with patience.